Costa Rica is an amazing destiny full of nature beauty and perfect beaches for surfing. But Playa Hermosa in Santa Teresa, from Puntarenas, is the best you can find. Here surfing is the primary activity, so let’s see why. Many tourists and natives are used to enjoy surfing here. Most of them visit it during the whole year and are always looking forward to coming back. It´s not only a beautiful beach with spectacular landscapes, but it has the best waves and weather conditions. You can get there on local flights too. There´s public bus service from San Carlos terminal in San José downtown directly to Santa Teresa taking around 6 hours. The Best Place to stay here is Perfect Sunset School. It´s a Yoga, Surf and Music School to learn and vacation in. You choose if you want a shared room or a single one. It´s in front of the beach in a nature reserve. There´s a Restaurant, with excellent options. It counts with a peaceful Ocean view where you can enjoy amazing sunsets. Accommodations are equipped with everything you need. You´ll get the most consistent waves in Central America. The temperature generally varies from 25 ° C to 36 °C. During the dry season, it´s warm and very clear. You´ll see a beautiful blue sky and strong winds. During the rainy season, it´s mostly cloudy but still warm. If you have never surfed before, let´s try it out. Don´t worry you only need some direction. You´ll get appropriate guidance in Perfect Sunset School with the best and highly experienced instructors. As well as sharing experiences with other surfers, will be a really significant chat for you. If you go to Playa Hermosa Santa Teresa, you´ll find lots of excitement with surfing. You can also have the chance to enrich your life quality with yoga, music and the opportunity to learn Spanish. Why not? Let´s make new friends and Party time! What are you waiting to get to know this amazing surfing spot? Perfect Sunset School! 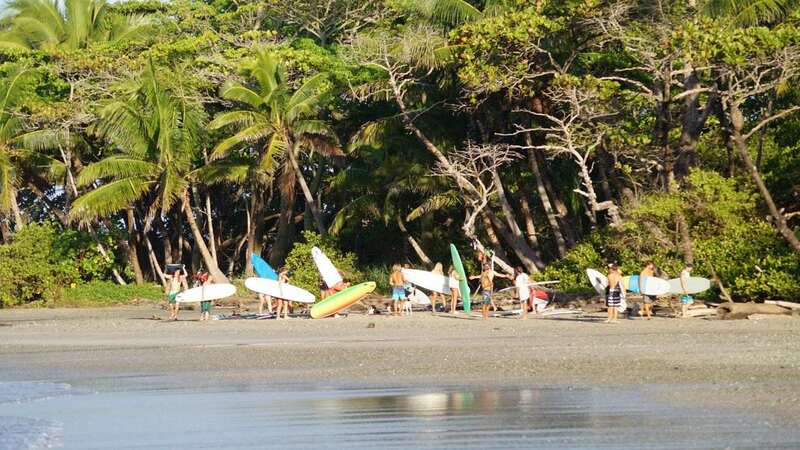 The best place to surf in Costa Rica!